John Morisey ’65 joined Phi Delta Theta because, from the moment he visited the chapter house, he knew it was the #1 fraternity on campus. And it didn't disappoint. "The first guy I met on the porch steps was Mac Boxley, who is a great friend to this day," said John. He even ended up meeting both his wife and business partner of 45+ years thanks to his membership. "My future wife was dating a Phikeia, and I snaked him! I'm also thankful I met Tommy Fonville ’68 because he became my business partner of 45+ years. I never would have had my career in real estate without him. It has been a beautiful friendship and partnership" John said. 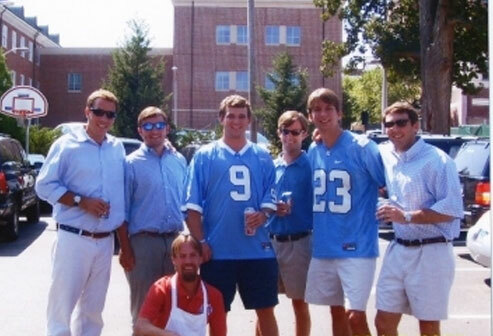 He added that he regularly connects with many Phi Delta friends living in Raleigh. "I see five or six fraternity brothers every week, and there are seven Phi Delts living in my neighborhood of 80 homes," he said. Because of all the friendships and lifelong memories he gained as a Phi Delt, John gives back to the chapter regularly. "I have realized how deep the friendships really are. I want to make sure current and future brothers have the same opportunities and experiences that I had," John said. 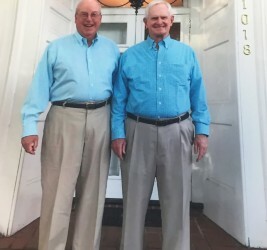 John and Tommy sold their residential real estate company in 2006, just before the market crashed. They continue to remain in business for land and small shopping center development. "Frances and I have eight grandchildren who all live within 10 minutes of our house. Our three children are all graduates of UNC, as well as their spouses. Our son Frank was also a Phi Delta and graduated in 2003," said John. Tell us about your Phi Delta experience. Click here to submit an update now.